People are led to believe that resistance training builds muscle. In actuality, it is more of a mechanism for breaking down muscle tissue and splitting fibers which in turn can provide new muscle growth. Your food and water intake along with proper rest determines how your body will build and repair itself. Therefore, it is imperative that you take in high quality nutrients for optimal training results. Here is a list of high quality, low fat protein sources that help to keep your body in a anabolic (muscle building) state, complex and simple carbohydrates for fueling lean muscle mass, vegetable sources that are high in fiber and sources of healthy fats. Chicken breast, turkey breast, lean ground turkey, orange roughy, haddock, salmon, tuna, top round steak, lean ground beef, egg whites, low-fat cottage cheese. Sweet potato, Yams, Steamed Brown Rice, Whole Wheat Pasta, Oatmeal, Beans, Strawberries, Apples, 100% Whole-Wheat Bread. Sports drinks, fruit juice, dextrose, fructose, white rice, bagels. Broccoli, Green Beans, Lettuce, Green peppers, Spinach. Flax oil, Canola oil, Avocados, Nuts, All Natural Peanut Butter, Salmon. It is recommended that you eat 4-6 meals per day. The goal is to reach at least 1 – 1 ½ gram per lb of bodyweight a day in protein and 2-3 grams of carbohydrates per lb of bodyweight. If you are trying to put on muscle or gain weight, shoot for the higher end of the spectrum getting most of your calories from complex carbohydrates with a lower protein ration. If you are trying to lose weight or reduce bodyfat, increase your protein intake and lower your ratio of simple and complex carbs. It should be noted that simple carbohydrates are best used within the 30 - 45min "window of opportunity" following a strenuous workout. During this time simple carbohydrates will help to boost your insulin levels which in turn act as a catalyst to shuttle nutrients into the body at a faster rate resulting in greater protein synthesis (muscle growth). 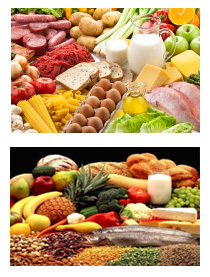 Simple carbohydrates should be limited at other times of the day as these types of carbs are easily converted into fat. Remember to get on a good workout program, where you workout at least 3 - 5 days per week along with some form of cardiovascular exercise. Keeping documentation or a journal of your nutritional habits is also invaluable. Visit www.fitday.com and get started on tracking your daily progress, weight goals and daily food intake. 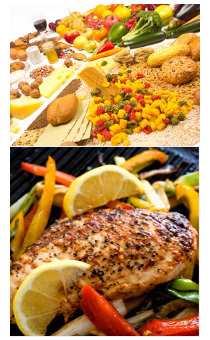 You can also visit www.dietfacts.com to find out the nutritional content of many foods. During the off-season, I try to add lean muscle mass by eating a variety of protein sources, complex and simple carbs. I try to eat a serving of beef, poultry and fish every day along with several servings of fruits and fibrous vegetables. I also supplement with protein shakes to keep my protein intake high. *Note - I mix all these ingredients together in a blender and drink it. Combine all the ingredients together in the pita and eat. Slice chicken breasts into wedges and set aside. Combine jerk seasoning, oil, vinegar and soy sauce in a mixing bowl. Stir to create a marinade. Place chicken wedges in the marinade and refrigerate for 30minutes. Heat up a sauce pan and coat with fat free cooking spray. Place chicken into pan and cook until brown. Slice lime in half and squeeze the juice of one half lime over the chicken. Serve over brown rice or with a salad. Combine first 4 ingredients in a bowl and mix thoroughly. Rub mixture over both sides of turkey. Place turkey in a baking dish. Add chicken stock and bake 30-35minutes or until turkey is glazed and cooked throughout. Combine the first 5 ingredients in a bowl to make the herb mixture. Take each chicken breast and slip fingers between the skin and flesh of the chicken, leaving the skin attached. Slide some of the herb mixture under the skin of each breast, pulling the skin back over each breast when finished. Mix together the orange juice, vinegar and worchestershire sauce in a small bowl. Grill the chicken breast on each side, turning once and basting with the orange juice mixture until the chicken is cooked through. Remove the skin before eating.